Sloping seaside gardens provide the opportunity to include a rock and gravel garden feature. This cottage garden by the sea in Ventry, Kerry, Ireland, includes species plants which are close cousins to those that occur naturally. The rocks are mainly local sandstone with a few with white quartz. The previous garden had an irregular sloping lawn. The garden was re-landscaped to have a gently sloping lawn and a steeper but even slope for the rock and gravel garden feature. 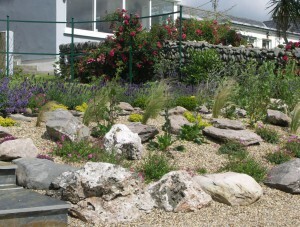 We took care to arrange the rocks in a natural way and use them to retain pea shingle. Moisture retention is crucial with drying salt winds and sandy soil . The pea shingle is therefore laid over geotextile to provide a mulch and weed barrier for low maintenance. We chose Eryngium planum (tall blue sea-holly), silene schafta ( pink sea campion), armeria maritima ( sea thrift), different thymes, lavender and stipa tenuissima as the main plants. It gives a lively and natural feel to the rock and gravel feature. They are all salt tolerant and low maintenance. Lavender sets off the rock garden below. 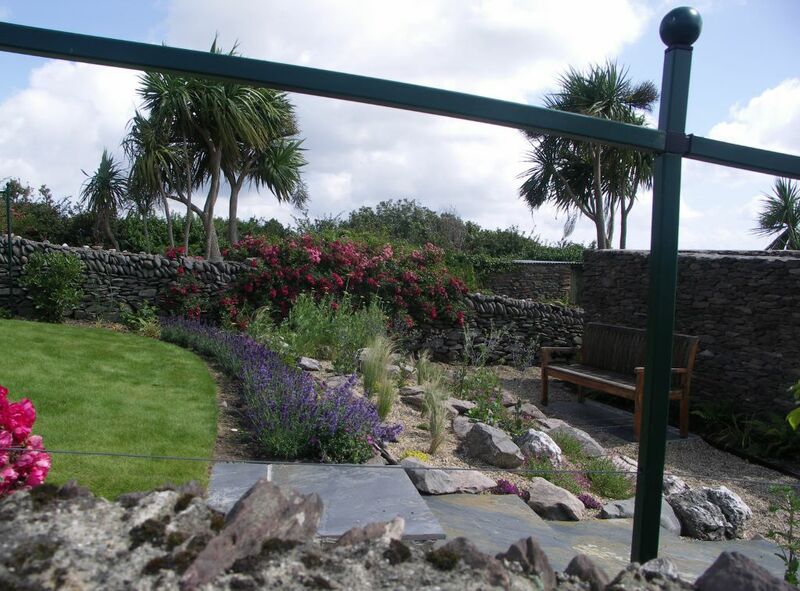 This entry was posted in Rock and Gravel Garden Feature and tagged cottage garden, Garden Design, Ireland, Kerry, Leaf & Acre, low maintenance plants, marine, North London, Planting Design, rock and gravel garden, sea holly, sea thrift, Seaside garden, sloping garden, Ventry on October 5, 2015 by admin.